The Data Source setting allows you to weaselproof your goal a little more than normal. Switching the data source from Manual to any of the other three options will hide the data entry boxes on the website and apps, so you can't enter data with them anymore. If you've weaselproofed the goal and the data source is not manual, you also cannot add data via email or SMS. The bot will send you a scolding email in response instead! 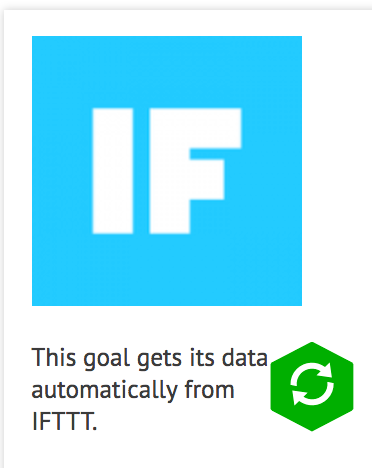 If Beeminder receives a datapoint from IFTTT or Zapier on a Manual goal, it will toggle the data source setting to the appropriate source. But if you don't like that change, you can undo it by switching the source back to manual. Beeminder won't toggle it back again after that. If your goal is using an autodata integration like Fitbit or RescueTime, this field will show that information and you can't change it. If you'd like to remove the autodata integration from the goal and switch back to one of the non-integrated entry methods, contact support to have it cleared.